Do you enjoy cooking for your best friend? It is such fun to create something special for your pup in the kitchen. One of the best things about making homemade treats is you have complete control of the ingredients. This is especially important if your dog has allergies. 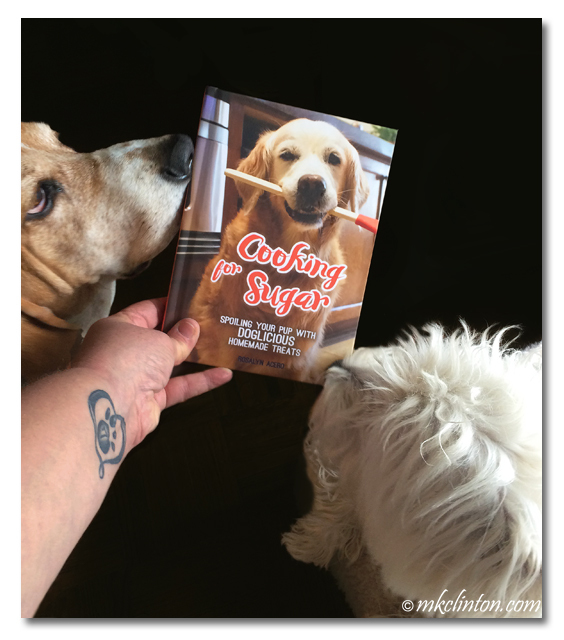 Cooking for Sugar is a doglicious cookbook written by my friend Rosalyn Acero. She has had several of her recipes printed in magazines and they are shared by pet parents on Pinterest all of the time. I was thrilled to learn she had a cookbook with some of her favorite recipes available on Amazon. It was an honor to be able to get a sneak peek and write a short review for her back cover. Rosalyn is best known for her popular blog, Golden Woofs. Her Golden Retriever, Sugar is the inspiration for her yummy recipes. If you aren’t familiar with Rosalyn and Sugar, you are really missing out on the fun. I met them at my first BlogPaws™ conference and knew right away that we were going to be great friends. 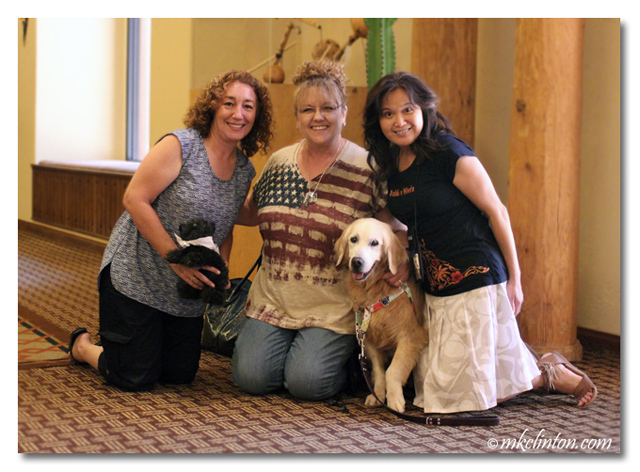 It was so exciting to catch up with her and my buddy Gina from Oz the Terrier again this summer at the 2016 BlogPaws. Cooking for Sugar is more than just recipes; she explains the benefits of super foods such as broccoli, kale, chia seeds and pumpkin. All of these ingredients are found in these healthy homemade treats. 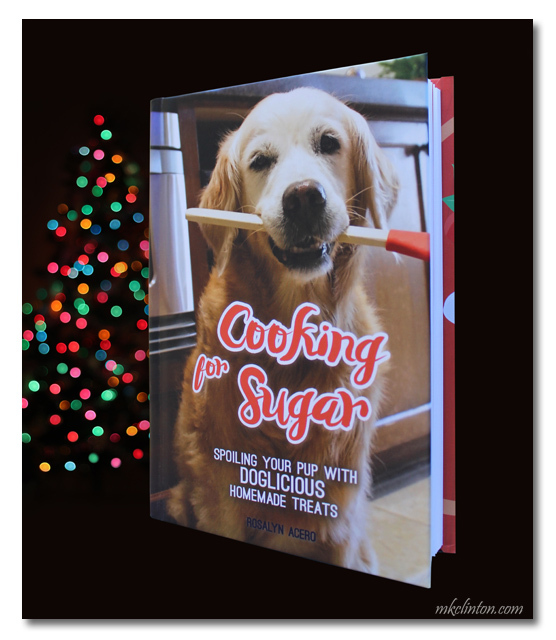 If you are searching for a pawsome gift for the dog lover on your list, fetch a copy of Cooking for Sugar by Rosalyn Acero. They will love it and so will their pooch! **Exciting News! Golden Woofs will be offering FREE recipe dog treat cards on their blog this Thursday and have generously offered Cooking for Sugar cookbook for Bentley’s 9th birthday party giveaway beginning on Friday! What a great idea. A whole book about doggie recipes and nutrition info. Sounds yummy. Oh yum, that book sounds good enuffs to EAT!!!!!! What an excellent idea to create a cooking book for dogs!!! Sounds like a great gift for the holiday!! Thanks for sharing. I'm sure it is a great cookbook because they always have great stuff in their kitchen! Sugar and her mom are pawsome! What a fun book for the dog lover...and owner. Oh, that is PAWSOME!!!! I LOVES Sugar! She has the bestest treaties! How cool is that! Congrats to Sugar on her new cookbook.